Best Magnetic Dartboards of 2019 - Full Guide & Reviews By Prof.
We all know how darts can be fun while playing alone and with friends, but it also boasts a number of other benefits; improved hand-eye coordination and fine motor skills, for starters. Often, parents shy away from the sport because they don’t want their children playing with sharp darts…but there’s another solution. With a magnetic dartboard, they’ll play with magnetic darts which means, above all else, no holes in the wall when they throw a loose dart. Today, we’re going to attempt to answer one of the most common questions in this niche; ‘which is the best magnetic dartboard?’ for children and for everybody. Which Magnetic Dart Board Should You Buy, Roll-up Magnetic or Hang-up Magnetic Dartboard? There are many advantages to using a magnetic dart board. The biggest advantage is how safe they are to use because the tips of the darts are flat rather than pointy and sharp. This means there is no chance of players poking themselves with the darts or damaging their minion dartboard or walls with them. The second big advantage is that the magnetic darts will reach the board a lot more easily than other types of darts would. If you can get the dart close to the board, the force of the magnet will do the rest of the work. This will make it easier for new players to get started with the game. Inexpensive – Magnetic dart boards are inexpensive because they are simple to manufacture. Easily Land Darts – The magnets of the darts make it easier to hit the board. Long Lifespan – Magnetic dart boards do not get damaged like bristle boards. The magnetic boards will last a very long time. Good for Beginners – New players will find it easy to hit the board with the darts. Lightweight Board – Magnetic dart boards are light and easy to mount. Some boards even come in “roll-up” form. The ideal size for the magnetic dartboard is 16″. Most of the magnetic dartboard manufactures make 16 inches dartboards. You can find large or small size in the market that is designed to be hung in your office or kids’ game room. Of course, you can carry easily whenever you will travel somewhere. But, If you buy a non-standard size dartboard you need to throw darts near to the dartboard instead of standard throwing line. When you want to purchase a magnetic dartboard, you need to choose a standard size dartboard. It will serve two purposes for you at the same. First one, when you start throwing, it will be well-equipped to hit the bullseye each & every time. And the other you gradually cope up with the standard throwing line that will helpful for you while joining in a tournament for competition. The biggest piece of the magnetic dartboard is a circular thin metal sheet, also known as a metal disc. The diameter of this metal disc should be about 16.5 inches. Dartboard manufacturers will then cover the disc with their own designs and patterns. They might use a soft velvet material to place over the metal disc. This material will show all the numbered segments of the board while disguising the metal at the same time. If you choose a roll-up or hang-up magnetic dartboard, you can expect the materials to be velvet and rubber steel. Since they are lightweight and easy to pack, people like to travel with them if they are going on a trip. The mounting installation of a magnetic dartboard should be simple enough. Most of these boards will only require you to hammer a nail into the wall and then hang the board onto the nail. These hang-up boards should have a special hole on the top of them for hanging the board. Sometimes these boards will come with a hook to give it extra support. Roll-up boards can also be installed in the same way. But if you are fortunate enough to get a stand-up board which has its own base on the ground, this might be the best option. You can place these boards in any room without needing to depend on a good wall to mount it on. Magnetic dartboards will usually come with 6 darts (2 sets with 3 darts each). Each set will have its own unique color. Standard dartboards will have 3 red darts and 3 blue darts. However, there are specialized darts available with some of these boards which have unique designs and patterns on them. When you observe the darts of the magnetic dartboard, you should try to pick the dartboard that comes up neodymium magnetic darts. Since the neodymium darts are well-balanced & cling to the dartboard like super glue. The neodymium magnetic darts won’t fall off, roll over, gravitate towards each other or slide around in any way. So there is no worry about damaging walls, furniture, or hurting anyone while coming up accidentally in front of your throwing. Which Magnetic Dart Board Should You Buy? Roll-up, Magnetic or Hang-up Magnetic Dartboard? This is a big question arisen in your mind whether should I buy a roll-up magnetic dartboard or hang up magnetic dartboard. For solving your complication thought, we have made the differences between these two different designed dartboards. Best for children & adults.g. Perfect for indoor & outdoor. No need to drill a hole to hang. A tube for easy carrying anywhere. Very strong & long lasting. Best for children & adults. Magnetic darts stick like super glue. Bit more price than roll up for its quality. Best for giving a gift. For children or just beginners to the game of darts, magnetic boards can be great fun…but which should you buy? These days, there are some brilliant magnetic dart boards available so we’re going to provide an insight into one of the popular models; the Marky Sparky Doinkit Dart Board. Ideal for: There are different uses of this board, but it is best for all ages & all skill levels. You can put things in a whole new league by settling for this product that is fully magical. First and foremost, we can’t talk about the benefits of choosing this magnetic dartboard over another without mentioning the brilliant neodymium magnets. Compared to the typical ceramic magnets you’ll find on many other models, these do come at a premium cost but the extra investment will provide added durability. What’s more, the likelihood of them popping out is small thanks to clever sealing. When first looking at the dart board, you’ll notice that it has the same appearance as a traditional bristle board. Whether it’s the size of the targets or even just the effect of the fake cracks, it will look great hanging on the wall. Some magnetic dart boards are incredibly difficult to mount onto a wall, it can feel as though you need an engineering degree just to get it set up. However, this board uses hardware that wouldn’t be out of place on the back of a picture frame. Since the board isn’t as heavy as real boards (this model is particularly lightweight), it takes just seconds to install and you won’t need extravagant mounting hardware. As we all know, one of the biggest benefits of choosing a magnetic dart board, or even a soft tip board for adults, is that you won’t make holes in the wall when your aim goes askew. With this particular board, the magnets won’t cause excessive damage and you won’t have to hire a builder just to fill your wall every so often. If you want to prevent small marks from the magnets, why not invest in some felt backing (this is especially useful if your walls are lightly colored! Can be used for friendly tournaments. Not the conventional dartboard design. Ultimate Verdict: All things considered, this is one of the magnetic dart boards you’re likely to find and we would recommend it to anybody – it’s durable, uses high-quality materials, and will provide endless hours of fun! Overall, this board has been well designed and is well worth the investment required on sites like Amazon! If you are looking for a quality and well-priced magnetic dartboard that serves hours of entertainment indoors, at all times & outdoors in the warmer months, then this excellent & impressive magnetic dartboard is for you. Ideal for: This 16” magnificent magnetic dartboard is perfect for kids, adults, lounge, game room, porch, and offices. Easy to throw with aerodynamic balanced fins, so they hit their target everytime and stick to the board not your walls. Top Quality Design: It has become the top quality in design for its well-rounded shape. Not only that its built quality is stronger enough for its great finished magnets inside in the dartboard. Whether you play darts for fun or with seriousness, to improve on hand & eye coordination, you will not get any bounce outs. Powerfull Darts: The included magnetic darts are very easy to throw, thanks to their well-balanced aerodynamic fins. When you throw the darts, the dartboard’s well-built and powerful magnets ensure the darts stick firmly to it. So, you get a better throwing experience, no doubts. Easy to Install: The Fun Adams Magnetic Dartboard comes with 2 hooks that ensure an easy installation. The hooks are strong enough to be used to hang it wherever you like. Not suitable for under 5 ages children. Whether you play alone, with a friend or the family, this great magnetic dartboard provides safety, improving better coordination & encouraging sportsmanship. The quality, colors, and durability make this magnetic dartboard stand out from other dartboards. Ideal for: There are many different uses for this sublime 16” magnetic dartboard, but it is best for children 6 years and older as well as adults. Powerful Magnetic Board: This Magnetic dartboard works well for entertainment for its powerful neodymium magnets. The magnets are enclosed inside the dartboard so perfectly that the magnetic darts will stick excellently. That means they won’t harm the wall by any means. Safety: Conventional darts can be dangerous, especially for kids, because the sharp point of the steel tip darts can stab you or hurt someone who accidentally gets in the way of a throw. It doesn’t mean you forgo playing darts in your home though. 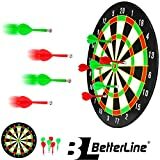 Better Line strong magnetic dart set makes the games of darts much fun and ensures your safety while playing. Lots of Add-ons: You will get all the essentials with this great magnetic dartboard for the safest fun way to spend your time. The dartboard has a keyhole on the back of the board ensuring easy installation. You will also receive the three red & three red magnetic darts sets with it. Ideal as a Gift: This dartboard is a superb gift choice for your loved ones. Be it for Christmas, birthday, Halloween, etc., you can never get it wrong by giving this dartboard as a gift to someone. Money Back Guarantee: With this safety dartboard, you’ll get 365-day money back guarantee against any defects. Ideal for as a gift. Backing Keyhole for easy mounting. Ideal safe board for home or office. Looking gorgeous for the brighter color. Not safe for under 6 ages. Not safe to hang nearby the cards & computers. Final Thought: This low-priced dartboard with 6 darts offers you ultimate fun experiences alongside safety you won’t find in any other magnetic dartboard. This wide variety of 7” magnetic fun gaming dartboard can be played for exercise, relaxation & is best for children and adults, boy and girls, indoor & outdoors. Dual Sided Board: Your game is in two different ways in this magnetic dartboard. This dual sided magnetic board is designed for game lovers who are longing for traditional & modern darts games on one board. One side of the board is designed for traditional games lovers. It is a great choice for children who wish to have fun or develop their skills, such as accuracy, attention, and counting. And the other side is designed to target the bullseye. Its eye-catching design can relieve your eye fatigue and is helpful for exercising vision. Asides that, you can develop your confidence, attention, hand-eye coordination by playing on this side. 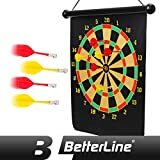 Great Alternative to Regular Dart Board: The blunt tips magnetic darts that come with the board is much safer than the traditional dartboard with sharp points. The 17” flexible cloth covered board protects your wall or furniture from any sort of damage. The most amazing feature is that you can roll up the magnetic board to store conveniently. You can even hang it anywhere in your home and outdoors by simply stripping on the top of the board. Super Magnetic Darts: The board is constructed with top grade rubber steel & velvet Material. For that, the board is very long lasting in nature. You get the full premium feeling when playing with this. The superb, powerful darts stick like glue immediately they land on the board without sliding or falling off. So, when you target the bullseye, of course, it doesn’t miss anyway. Real Breakthrough: If you are very stressed or tired after working for a long time, you need a real breakthrough. Isn’t it?. 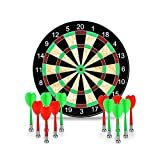 This good value magnetic dartboard serves as a great stress reliever and also helps hone hand-eye coordination skills. You will get all these benefits by simply fixing it at your home or office. Portable & Hanging Everywhere: You will definitely love this board because it allows you to safely have fun or hone your skills anywhere. The portability of this roll up magnetic dartboard is simply amazing. You can carry the board with you anywhere by simply rolling it up. Not only that, you can hang the board wherever you desire. Guarantee: You can enjoy flawless, outstanding playing experience with this magnetic roll-up dartboard. You will get a 100% satisfaction guarantee and enjoy a lifetime warranty against any defects. So, enjoy tension-free gameplay. Darts stick like super glue. Comes with 6 superb magnetic darts. Great alternative to the traditional dartboard. Not suitable for under 6 years. This quality magnetic dartboard is just amazing. It can be used indoors and outdoors by children and adults alike. Whether you intend playing darts for fun or to develop your skills, this dartboard is the perfect choice for you. Ideal for: This 17” double-sided magnetic dartboard is not only ideal for home, office, club but also best for outdoor using. Super Convenient Dartboard: The cool & portable magnetic dartboard will provide very convenient fun games experience for children, family, anybody at all. You don’t need to drill a hole in the walls or door to hang the dartboard. You can play games on this dartboard indoors by simply spreading it on the floor, or you hang it anywhere. You can roll the board into a storage tube and go use it outdoors if you want. Overall, its features help you develop your hand & eye coordination anywhere. Double Sided: This magnetic dartboard is designed in a way that serves two purposes amazingly. If you love to play traditional darts games safely, one of its sides serves that purpose. This side is quite amazing for children. Your children can enhance their mathematical skills by aiming the magnetic darts at this part very well. So, it serves two great purposes, one is fun, and the other is education. The dartboard’s design on the other side looks just like a professional set. This side offers single, double, triple bull’s eye and catch ring that is quite vividly looking in graphics. Whether you stay at home or travel anywhere in the world, nothing can stop you from playing the game of darts. As you can improve hand-eye coordination, accuracy, and attention targeting the bullseye anywhere by simply hanging it. Flat Tipped Darts: This affordable magnetic dartboard comes with six magnetic darts. Three of the darts are red colored & 3 are yellow colored. You can get really amazing, safe fun through this darts set. These well-designed darts have no point; instead, the tips are flat. The ultra-powerful magnetic flat tip that really sticks to the dartboard like glue. These won’t fall, gravitate each other, slide around, damage walls and furniture, or hurt anyone. So, these darts offer great, safe playing experience that surpasses your expectations. lasting rope for hanging the board. The magnetic darts stick green to the board. Not suitable for under 5 ages. 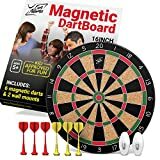 If you want to develop a great family bond and develop your children’s skills through fun with the lowest priced, high-quality & safety magnetic dartboard, then this is for you. Ideal for: This 16” magnetic dart board is ideal for children up to 5 years & adults at the same time. 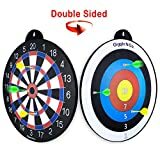 Reversible Magnetic Dartboard: This highly-quality, double-sided magnetic dartboard helps to develop parents and children connections, while offering great family fun at the same time. 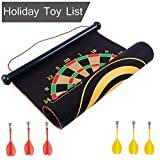 The front of this fun dartboard is for beginners to advanced level players, while the back side is the best for kids who want to develop their math skills while equally safely playing darts game. Strong Neodymium Dart: The dartboard provides great, safe fun for your children and family, as it comes with 6 super strong neodymium darts which are well-balanced and cling on the board superbly. Its strong neodymium magnets ensure that the magnetic darts won’t fall off, roll over, gravitate each other or slide around. Developing Hand and Eye Coordination: Playing darts generally helps to develop hand and eye coordination. But this dartboard will not only provide a fun experience for children as they play but also help to develop important hand & eye coordination at the same time with great safety. Guarantee: GiGGLE N GO is more concerned about their customers’ satisfaction. If you are not 100% satisfied with the dartboard after buying, you will get a full refund by simply contacting with them. 2 games in 1 dartboard. Not suitable under 5 ages. Not available in all store. Final Thought: If you want to develop family connections in a better way and also develop your children skills through fun darts games within the lowest budgets, then you can go with this magnetic dartboard. You’ll definitely love this product because BetterLine has made this dartboard iconic. As a dart gaming lover, you can take the dartboard along with you, whenever you travel somewhere. This great feature erases all your frustrations and safely creates a good connection among family members. Ideal for: This 16×19 inch magnetic dartboard is great for children up to 6 years and adults. Long Lasting Quality: This roll-up magnificent magnetic dartboard is easy to set up. Its darts are made with high-quality materials. Its top-quality magnets ensure that the darts will stick firmly to the dartboard instead of bouncing out. The darts flight will stay clanged to the darts for its well constructed, so these are well-balanced experience in time throwing. Flat Strong Magnetic Darts: One of the most important features of the darts is that it protects your home walls & furniture. The reason is that the darts points are flat instead of sharp metal points. The flat tips of the darts make the darts set safe for kids age six and up. Fun For All Ages: This durable dartboard is perfect for fun time with friends, family, coworkers, at parties, etc. Not only that, this dartboard set is best for both children & adults. Includes Everything: This roll up magnetic dartboard has included everything you need to play the games. You get 3 red and 3 yellow colored darts that are very well balanced for hitting. You also get a storage tube where you can keep the dartboard. If you are a beginner, then the instructions book will be helpful for your better playing experience. A storage tube for the dartboard. Final Thought: If you are looking for a quality dartboard within low budget with the best safety playing features both for adults & children & that works well in game room & outside, then you must go with this low priced & high-quality magnetic dartboard without further thinking. This dartboard is designed in a way that you can improve your accuracy & hand-eye coordination significantly. The safety features do not only offer safe fun for all but also grow attention at the same time. Ideal for: This 11.5 inches dartboard is ideal for children up to 6 years & adults. A modern twist on a classic game, the magnetized dart board reduces frustration and is safe for children to use. This set includes an 11.5-inch dartboard and six (6) lightweight magnetic darts. Magnetic darts won't damage walls or floors. A keyhole slot on the back of the dartboard makes hanging easy. Magnetize Dartboard: This magnetized dartboard offers a modern twist to classic darts games. Children can have great, safe fun with it. Due to its good quality, they can play for hours without facing any issue. The high-quality magnets make the board great for indoor plays at any time. It does not only provide fun for you but also helps improve children’s arithmetic skills. Easy to Install: You don’t need an expert to Install this magnetic dartboard. You can Install easily. The keyhole slot on the back of the dartboard makes hanging indoor or outdoor easy. Comes up 6 Super magnetic darts. Not good for Heavy use. The pull of this product can help you explore the beauty of the game of darts in a dynamic way. It has all the right components that you cannot find with most conventional dart boards. If you want something that will help you break into new frontiers, this is the product that can make it happen for you. Who it is for: This powerful dartboard is great for all ages and skill levels. It is good for Grandchildren, teens, and kids. It is able to create fun for all the family. · HUGE SIZE&MAGNETIC DARTS: This set includes an 17-inch dartboard and 12 standard lightweight magnetic darts. Beautiful Magnetic Dart Board: The beauty of this product is that it can be used for kids across the range and it has a trendy appeal. I was able to take my kids through the rudiments of the game of darts, and the results were quite impressive. The darts were able to hold on the dartboard because the magnet is quite powerful. I used the board to show my kids that there is nothing complex about shooting for the stars when it comes to the game of darts. I used this opportunity to share some life lessons that I know will be invaluable to them. Quality Assurance: The 6-month warranty that comes with the dartboard has made it the choice product for those who value real quality. I was able to share this information with a friend, and he told me that the response he got from the company is sublime. He purchased a product online which had some defects, and the dartboard was replaced within 2 working days when he complained to the company. I am impressed with their customer service culture and the experience they are helping to create for their customers. Powerful darts: The 17-inch dart board design is something that will put a smile on your face. Also, the 12 colorful darts are something that will help you teach your children the basics of the game. Each of the darts contains magnets which makes it safe for children to use. I will keep sharing one story that drives home this lesson. I told my kids to go and try their hands on the game of darts, and I was surprised when I discovered that they were throwing the darts at each other. I was glad that the dart has safety features which did not cause any harm to my kids. Top line design: There are some cheap brands that are made of cardboard. Beyond the fact that they are not durable, they can add a sad twist to the way you experience the game with your kids. I like the way that I was able to take things to a new height with my children because the game was set in a way that gave me a wonderful time. I am highly impressed with each frame of the dart board. Good for family game nights. Perfect as a gift for kids. Comes with colorful dart designs. Not sold in all countries of the world. Not ideal for professional players. Final Thoughts: It is important to talk about the unique features that you can find with this product. I have been able to lead my children into a rich understanding of the game of darts through this sublime channel. I believe that anyone who wants to light up their world should connect with this unique brand. I recommend it for those who want their kids to raise their game to a whole new level.